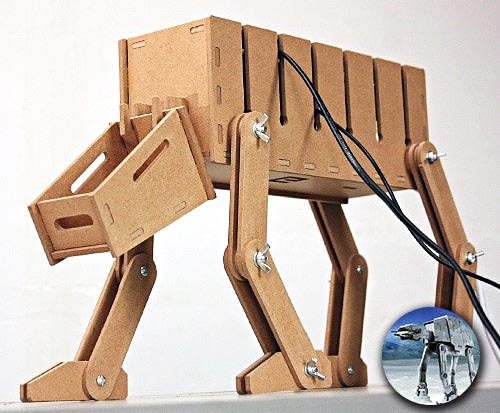 In this article, Star Wars AT-AT is not only the most fierce war machine, but also an useful handmade gadget for your tangled wires. obviously, the Star Wars AT-AT model is made with wooden boards and metal screws. Many U-shaped slots are placed at the back of the AT-AT. I believe the war machine is strong enough to hold up your various wires or cables. And moreover, it seems the all articulations by metal screws can be easily disassembled. The wooden Star Wars AT-AT comes from TaoBao, the most famous C2C online shopping web in China. Unfortunately, we haven’t found the useful gadget. Perhaps, the early bird catches the worm.